If you’re a music fan, then Milan could be the city for you. In fact, music and Milan go hand in hand, with venues that cater for every musical taste. From classical through to indie, there’s something in this city for all music lovers. Milan’s obvious musical claim to fame is the prestigious opera house, Teatro alla Scala, or as it’s affectionately abbreviated to, La Scala. Within opera music circles, the theatre is regarded as the world’s premier classical venue. Built in 1778, it is the concave channel beneath the orchestra that is credited with its outstanding acoustics. National Geographic rated La Scala as the number one classical venue in its book, "The 10 Best of Everything". If you fancy partying with the locals, then Q21 could be the perfect place for you to let your hair down and dance the night away. It is one of the hottest nightspots in Milan for people who love the clubbing scene, and just a brief walk from the Loreto Metro station, on Via Padova 21. Admission prices are similar to most Milan clubs at an average of €10; prices may vary if the club has a special guest or vee-jay appearance booked. Q21 has an excellent reputation for being a friendly and welcoming dance venue, however, as it’s only open on Friday and Saturday evenings from 11 pm to 5 am, it may only be suitable for the most ardent clubber. The Le Trottoir club has been a Milanese favourite for many years and many expected it to fade away after it moved to its new premises at Piazza XXIV Maggio 1, but this diverse venue that attracts both local and international artists is still going from strength to strength. The venue hosts live music and sometimes likes to stage art exhibitions to run consecutively, giving it an air of art meets intellectualism. During the week, Le Trottoir is essentially a meeting place for a more varied artistic scene including musicians, poets, writers and artists. Perfectly positioned in the historic centre of Milan’s nightlife, it becomes more of a live music venue at the weekends, with the emphasis being on the soul and funk genre. For those who want to dance, there’s a DJ upstairs that plays a mixture of dance, hip-hop and top 40 pop tunes, and a small chill out space where it’s possible to have a quiet drink. Internationally famous music acts, like Lady Gaga and One Direction, take to the stage in Milan’s Mediolanum Forum, the largest multi-purpose stadium for sports events and pop concerts. 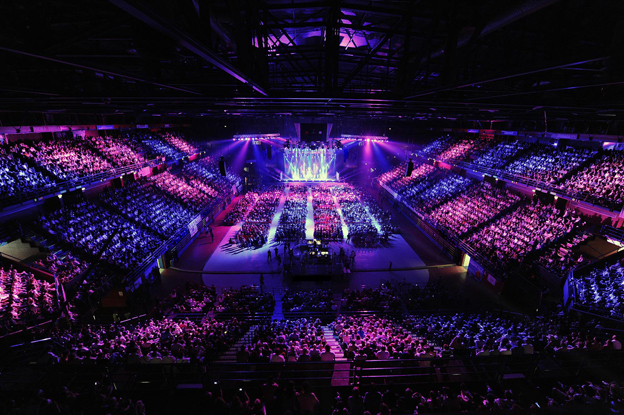 Situated in Assago on the outskirts of Milan at Via Giuseppe di Vittorio 6, this 12,500 capacity stadium hosts concerts by some of Italy’s pop elite like Alessandra Amoroso, Tiziano Ferro and Italy’s queen of rock, Gianna Nannini. Ticket sales for this venue sell out quickly, so it’s advisable to check online months in advance of your trip to secure your chance to ‘rock out’ with the pop and rock fans of Northern Italy. For the ‘free spirit’ within you, why not pop along to the centrally based Ostello Bello. In this aptly named, beautiful hostel that is located on a cobbled backstreet is an unpretentious and welcoming space, where you can chat, relax, read and even play the piano if you’re inclined to do so. Situated on Via Medici 4 and open each day from 9 am to midnight, it is possible to use the bar without booking into the hostel. The bar sells a selection of food and beverages and sometimes hosts live music acts, everything from local bands to international music. Here the Milanese aperitivo is cheaper than many other bars and the heterogeneous interior with its diverse, non-uniform seating is conducive to strangers interaction; many say they leave the venue having made a new friend. My final two choices are as different from each other as they are from my previous recommendations. The first is Adulis Pau Brasil, situated on Via Melzo, 24. As the name suggests, it’s a bar and restaurant that brings a taste of Brazil to Milan. The atmosphere here is as vibrant as the costumes of the live acts that appear most nights. Open daily from 10 am to 2 am, this is certainly not the place to be if you prefer your entertainment to be down-tempo. The bar experiments with a variety of thematic evenings, but everything is definitely South American with the emphasis firmly on fun. My final recommendation is a little bit risqué and only occurs sporadically. The Salon Parisien on Via Ascanio Sforza 81, for only two Saturdays each month, stages a cabaret show guaranteed to bring the colour to your cheeks. The Royal Burlesque Revue has been a great success with the Milanese looking for something different. Spectacular staging, music and artistes of refined beauty bring a touch of Parisien mise-en-scène to the grand stage at the Salon Parisien. Between performances, DJs play retro-chic balanced with international music with a stress on vintage groove. An evening here promises all the classics that the clubs in Paris offer, mesmerizing cabaret, vaudeville and glamour. Please note, the dress code at Salon Parisien is strictly formal. Milan really is a melting pot for music lovers with a plethora of venues that cater for all tastes. Whether you’re looking for an intimate space to have a drink while a retro-chanteuse sings at a piano, a Euro-disco bar with booming pop tunes or a an evening of arias, you can guarantee to find it in Milan.